1. Thoroughly clean your boat cover with FABRI-KLEAN® and allow to dry. 2. Spray on CANVAS SHIELD® waterproof spray and allow to dry, and cure. 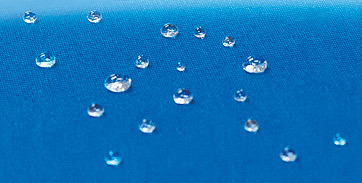 CANVAS SHIELD™ utilizes a new proprietary NANOIZED POLYMER™ technology, to create a hydrophobic and oleophobic coating on Sunbrella and other marine canvas boat covers that resists water and water based stains as well as oil and oil based stains, while still maintaining the texture, feel and breathability of the original canvas cover. It's one component and ready to use. Just spray it onto your boat canvas. It's clear so there is no color change and no milky appearance. Simply put; it's the best fabric guard on the market today. It's so effective that it can even be used to waterproof and oil proof facial tissue. NOTE: Most boat covers, Bimini tops, boat and pontoon boat covers, dodgers and T-tops can be conveniently cleaned with FABRI-KLEAN™ fabric cleaner and waterproofed with CANVAS SHIELD™ fabric guard, while in place, on the boat. Sail covers and boat cushions will have to be removed and cleaned and waterproofed with the fabric guard on the dock or off site. Always spray CANVAS SHIELD™ outdoors or in a well ventilated area. 1.Spray the exterior surface of the marine canvas with a jet of water from a garden hose to blast away any loose dirt and wet the surface thoroughly. 2. Spray FABRI-KLEAN™ directly onto all tough soil such as bird droppings and then spray the entire surface with an even mist. 3.Scrub the marine canvas with a soft bristle brush until all soil has lifted. 4.Spray clean with a jet of water. Repeat 2. and 3. if necessary. 5.Allow boat canvas to dry thoroughly. 6. Spray CANVAS SHIELD™ fabric guard onto Sunbrella or other marine canvas fabric until evenly wet (or apply with a lint free, low knap, fabric paint roller or paint brush). 7.When dry to the touch apply a 2nd coat. 8. Allow CANVAS SHIELD™ fabric guard to cure 12 to 24 hours, depending on temperature and humidity, protecting it from rain or dew. The most popular brand of marine canvas is Sunbrella. Top Gun, Top Notch, WeatherMax, Shoretex, Coast Guard, Recacril, Outdura and Sunforger are other common brands. There are others. They are mostly made with solution dyed acrylic or polyester threads. FABRI-KLEAN™, fabric cleaner and CANVAS SHIELD™, fabric guard, can be safely used to clean and waterproof all marine canvas as well as other outdoor fabric made from natural and synthetic yarns. CANVAS SHIELD™ waterproof spray, fabric guard is a green product that's environment friendly, human friendly and boat friendly. It's VOC compliant and does not contain PTFE which can release cancer causing PFOA. It does not contain Silicone which can create yellow stains and void the warranty on some marine canvas boat covers. So, what's a PFOA and what's the big deal? Use to water proof Sunbrella boat covers, pontoon covers, bimini tops, t-tops, dodgers, sail covers, cushions, awnings, tents, convertible car tops, patio furniture, and all outdoor fabrics. Effective at protecting and waterproofing Sunbrella, Top Gun, Top Notch, WeatherMax, Shoretex, Coast Guard, Recacril, Outdura, Sunforger and other brands of acrylic and polyester marine canvas. Durable. Lasts up to 1 year or more. Protects against rain, water pooling, water and oil based stain, mold, UV, Color Fade. DIY Friendly. Easy to Use. Easy to Maintain. Latest Environment Friendly Nanoized Polymer technology. Lower VOC's. Continues to water proof boat covers, even when surface coating is worn from abrasion, excessive washing and environmental attack. Maintains original color, feel and breathability of marine canvas. Safe. Non flammable when dry. Marketed with System Matched, Free Rinsing, Environment Friendly FABRI-KLEAN™ canvas cleaner. Used for original cleaning and safe maintenance washing. 100% Customer Satisfaction or Your Money Back Guarantee! CANVAS SHIELD™ penetrates deep into the fabric like Sunbrella Boat Covers, to coat each thread with its New Nanoized Polymer for Superior Waterproofing, and Protection against Stains, Mold, UV, and Color Fade. Marine fabrics remain breathable, flexible and retains its original color. It's PFOA Free, Non Toxic, VOC Compliant, Environment Friendly and Safe for Natural and Synthetic fabrics. Easy to use. DIY Friendly. Extends the life of Sunbrella boat covers. Restores tired marine canvas boat covers with renewed water proof and stain proof. Does not affect color, feel, breathability. Withstands repeated washing without re-application. Continues to waterproof even after surface coating is removed.